The second edition of Klankvorm will take place on the 15th of June in the century old cinema now known as KINO Rotterdam. KINO is the perfect venue to present immersive live cinema projects. For this edition SHXCXCHCXSH and filmmaker Pedro Maia will present the Dutch premiere of their collaborative project, and Davide Carbone will present his Honzo project in collaboration with media artist and filmmaker Nan Wang. SHXCXCHCXSH is the mysterious duo from Sweden exploring the darker and more experimental realms of techno. SHXCXCHCXSH is labeled as one of the most unique projects in today’s electronic music, with releases appearing on Semantica, Subsist and Avian. In their live shows they blend elements of noise, glitch, drone, broken beat and heavy industrial into subtle and transcendent soundscapes. Klankvorm is proud to host the Dutch premiere of their collaboration with Portugese filmmaker Pedro Maia. Known for his exploration of analogue film, Maia expands the aesthetic and technological heritage of 16mm and 8mm material. 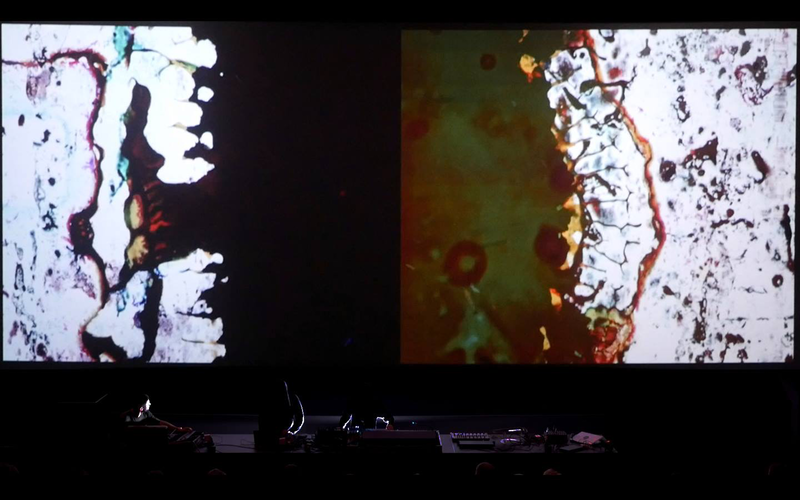 For this collaboration Maia presents “Imperfect Film”, paying tribute to celluloid film – the main raw material used by cinema during its first century of existence – offering an exploration of both its qualities and limitations. Based on images collected in 16mm films, damaged by the passage of time, the experience of cinema is brought back to its essentials: light and movement. Davide Carbone is known for his distorted, drony and hallucinatory techno. The Honzo project was born out of Carbone’s interest in human psychology (primary emotions like fear, anger, sadness) and desire to reveal the bipolarity of his musical expression. The performance is characterised by submerged futuristic breakbeats, haunting cinematic soundscapes and cutting edge modulations. Media artist, designer and filmmaker Nan Wang is based in Rotterdam. Her work is focused on the interplay ￼between memories, identities and technology. For this collaboration, Nan Wang reimagines her work ‘Dust Poetry’, 7000 frames of dust and black and white analog 16mm footage of small plants and insects.